This is your lucky month if you are ​anywhere ​near Los Angeles. Call your friends there if you are not! 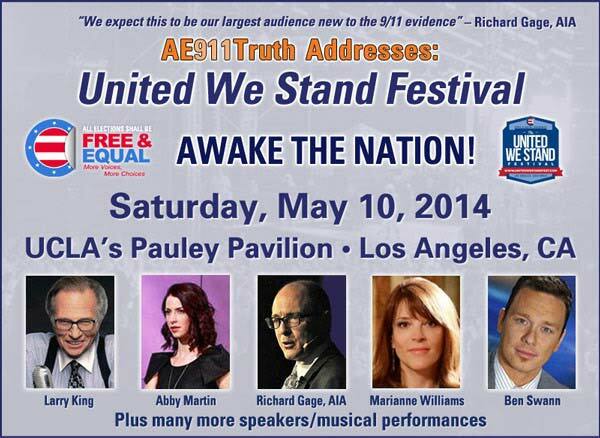 We will be speaking in a short panel format at the United We Stand Truth and Music Festival hosted by “Free & Equal ​ Elections​” at UCLA’s Pauley Pavilion in Los Angeles on Saturday, May 10, 2014. The UWS Festival will showcase music as well as panels of musicians, actors, writers, journalists, and other speakers. 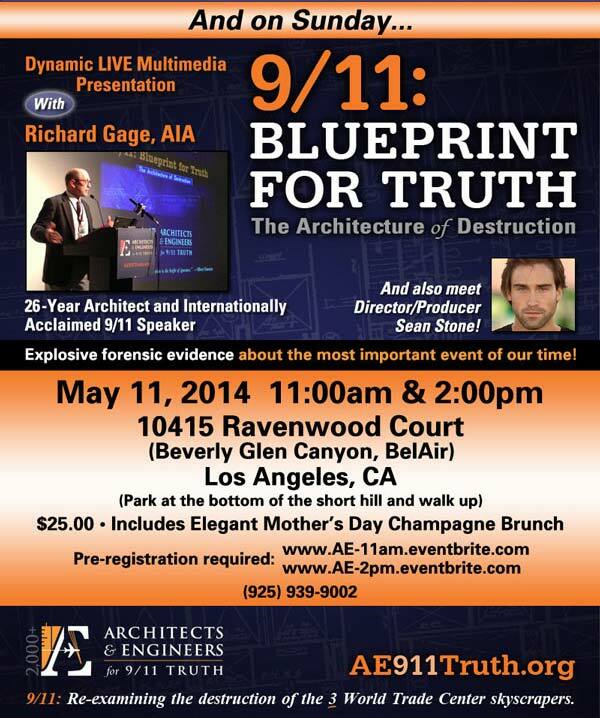 The next day, on Mother's Day, we will be presenting the WTC evidence in our 90-minute "9/11: Blueprint for Truth" live multimedia presentation to two groups of 40 guests at the home of Kathleen Rosenblatt - just five minutes away from the UCLA event. VIPs and Festival attendees alike will be attending the fabulous affair which includes an Elegant Mother's Day Champagne Brunch! You must pre-register, because there is limited parking and seating. We have the opportunity at the United We Stand Festival to bring 9/11 Truth from the World Trade Center to the West Coast, reaching more than a thousand folks who are newcomers to the explosive evidence. We will be addressing audience members who are coming either to see their favorite bands, like Immortal Technique and Wu-Tang Clan, or to hear other experts in the fields of the Patriot Act, the NDAA, the NSA, the war on drugs, drones, foreign policy, GMOs, Internet freedom, election reform, and more. Speakers include RT’s Abby Martin, Ben Swann, congressional candidate Marianne Williamson, Christina Tobin, Ellen Brown, Kimberly and Foster Gamble, Luke Rudkowski, Sheriff Richard Mack, and a dozen other inspiring speakers. This is the largest assembly of newcomers to the 9/11 Truth issue that AE911Truth has ever spoken to - even if only for a very short time. The events will be recorded and broadcast globally. If you can't make it to LA, then please consider supporting our efforts with your donation.